Yonah Schimmel’s Knish Bakery is a bakery and restaurant, located at 137 East Houston Street (between First Avenue and Second Avenue), in the Lower East Side, Manhattan, that has been selling knishes on the Lower East Side since 1890 from its original location on Houston Street. Yonah Schimmel’s is one of the few distinctly Jewish businesses and restaurants that remain as a fixture of this largely departed culture and cuisine. Combine flour and a pinch of salt in a large bowl and make a well in the center. Add 1⁄2 cup water and 1 tbsp. of the oil to the well, then, using a large spoon, gradually stir flour into liquid until dough forms a rough ball. Turn dough out onto a lightly floured surface and knead until smooth, about 15 minutes. Transfer to a clean bowl, cover with plastic wrap, and set aside for 30 minutes. Meanwhile, put potatoes into a large pot, cover with cold water, and bring to a boil over high heat. Reduce heat to medium and cook until soft, about 30 minutes. Drain, then transfer to a large bowl. Heat about two-thirds of the remaining oil in a large skillet over medium heat. Add onions and cook, stirring often, until soft, about 20 minutes. Transfer to bowl with potatoes and mash with a potato masher until potatoes are no longer lumpy. Season to taste with salt and pepper and set filling aside. Preheat oven to 375°. Line a large baking sheet with waxed or parchment paper and set aside. Combine egg and 1 tbsp. water in a small bowl and set egg wash aside. Divide dough into 12 pieces, then shape each into a ball. 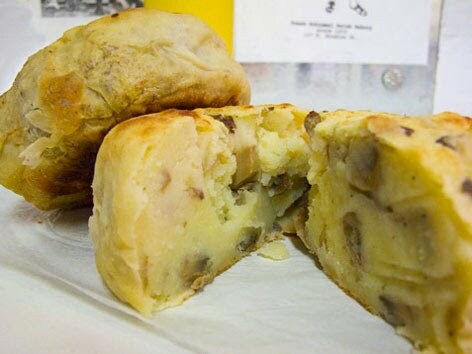 Make one knish at a time, keeping remaining dough covered with plastic wrap to prevent it from drying out. To make each knish, roll out dough ball on a lightly floured surface into a 7" circle. Brush surface of dough with some of the remaining oil. Mound about 1 cup of the filling in center of dough and fold dough up and around sides, leaving top of filling exposed but overlapping edges of dough slightly to make a snug fit around filling. Transfer knishes, as finished, to baking sheet, brush tops with egg wash, and bake until lightly golden, 25-30 minutes.